Well, I was going to devote today’s blog to one of my rare sports posts so I could talk about the Mike-Leach-vs.-Texas-Tech thing. But Tech finally decided they didn’t want to deal with angry, torch-bearing mobs and gave Leach his contract. So in the absence of anything else, let’s hit some quick reviews. It’s the last issue of this comic, and they don’t send it off on a high note. The Calculator has new powers that let him control any machinery, and he’s invaded the Birds’ HQ with a giant scary robot. They manage to get away, but lose their headquarters in the process. They raid the last stronghold of the Silicon Syndicate and mash ’em flat except, again, for Calculator. So Babs has a crisis of confidence and quits the team to see if she can get the use of her legs back and become Batgirl again. Wait, what? Verdict: Thumbs down. The story was far, far too rushed. The ending was forced. Characterization was almost nonexistent. And I really don’t get DC’s new craze for rolling back their clock to the Silver Age. They brought Hal Jordan back, they brought Barry Allen back, they’re somehow going to shoehorn Babs Gordon out of her completely awesome role as Oracle the computer guru and try to turn her back into one of Batman’s dull sidekicks again. 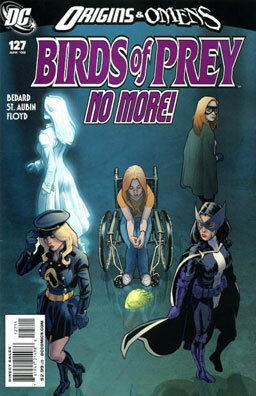 Wouldn’t surprise me to hear that they’re going to de-age Nightwing to get him back in the Robin costume next. 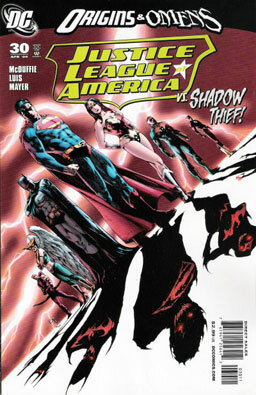 The Justice League has managed to subdue the Shadow Cabinet, but they all get ambushed by the Shadow Thief, who’s managed to get a lot more powerful recently and has decided to kill both teams as a sacrifice to some unnamed god. They all have to fight shadow-versions of themselves. Meanwhile, back on Earth, Rocket shows up (Yay! Rocket! ), schools Batman (Wait, what? ), and reveals that the Shadow Cabinet has given Dr. Light (the female Japanese superhero, not the crazy evil barfbag villain) a new powersuit that lets her use her superpowers again. So they all manage to defeat Shadow Thief, but he has one last surprise — he’s created an evil shadow-version of the moon, and he’s going to crash it into the Earth. Superman manages to bash it to bits, but the Shadow Cabinet gets away. Verdict: Thumbs down. I actually liked some parts of this — I still can’t get over how much I’m liking seeing the Milestone Media characters here in the DCU, some of the dialogue was quite good, and the Evil Shadow Moon was both cheesy and cool. But dangit, I just cannot take any comic seriously that tries to tell me that a halfwit dork like the Shadow Thief is a serious threat. And isn’t it about time they gave the superhero Dr. Light a new name?